It's hard to function properly when you're sleep deprived. Any parent of young children or junior doctor will testify to that. Most will also find themselves feeling more emotional and less able to concentrate than when well rested. On the other hand, great scientists, musicians, athletes and inventors throughout history have ascribed momentous breakthroughs to inspirations that came to them during or after a good night's sleep. Sleep seems to be vital to all living creatures. It's persisted throughout the evolution of mammals and birds and there's always a rebound phenomenon whereby a "sleep debt" stemming from sleep deprivation gets paid back once the creature has a chance to sleep. The sleeping brain used to be likened to a death like state, but over the last 50 years, since the discovery of "Rapid Eye Movement" (REM) sleep it's actually become clear that the sleeping brain is highly active and that maintenance and improvement of higher mental function is probably one of the most important reasons why we all need sleep. Numerous research studies over the years have confirmed what you probably already realised if you've ever dragged yourself into work bleary eyed after a night up with a teething baby – sleep loss affects intellectual activity across the board. Memory, co-ordination, physical performance, mathematics ability and problem solving are all affected when objectively tested after people haven't had a good night's kip. People who've missed out on just one night's sleep before viewing images they'd never seen before remember about 10% less than others who rested well before studying. Brain images from a functional MRI scan showed reduced activity in the hippocampus region of the brain, an area that is crucial for memory processing. In another study on healthy volunteers, brain scans done after a sleepless night showed brain electrical activity similar to that seen in psychiatric illness. It may sound like old fashioned advice that your grandmother may have given, but it's also the best that modern science has to offer. The idea is that the sleeping brain keeps on working on what you learned in the day. It sorts through the day's memories and organizes them, while the window of memory is open in such a way that you can see the bigger picture far better than you could when awake. Even a daytime nap has been shown to improve memory of fact based information like pairs of words, numbers, or irregular verbs, as long as there's some deep sleep, known as stage 4 sleep. 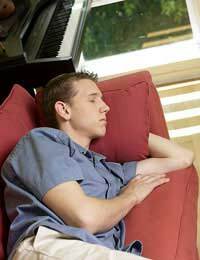 Lighter sleep, known as stage 2 seems to be important for learning motor skills like those needed for playing musical instruments or sporting activities. REM is good for pattern recognition skills, like those used in playing chess or bird watching. Many musicians have had the experience of a piece of music that they can't quite master in the evening practice session, but which just seems to flow by itself the next morning. Golfer Jack Nicklaus went through a bad patch when he couldn't quite get his swing right. Then he dreamt he was holding the club slightly differently and playing better. Sure enough, once he tried the new technique that he'd dreamt of, his career was back on track. The 19th century chemist, Kekule, was working on a problem that baffled all the scientists of his day – no-one could work out how 6 carbon atoms fitted together to make a benzene molecule. Organic molecule structure was the hot topic of the moment and all the other similar compounds were composed of long strings of carbon atoms. But benzene was frustrating all the best chemical minds – until Kekule dreamt of a snake seizing its own tail. When he awoke, he realised that the circular snake image held the answer to his conundrum. The benzene molecule had to be a ring structure, rather than a straight chain! This discovery was a landmark in the history of chemistry. Similar examples of night time inspiration abound, in every field of endeavour. So it seems that Granny really did know best – if you've got a problem, sleep on it!